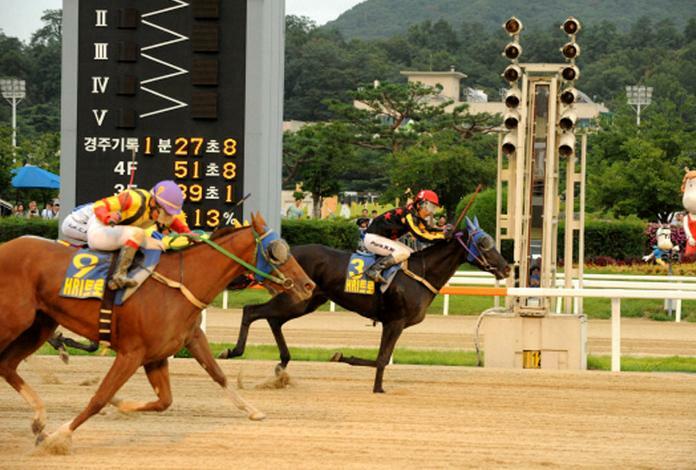 No International jockey Challenge this year – we’ll have 6 visiting jockeys in town for the Asia Challenge Cup later this month – but the annual international exchange races went ahead at Seoul Racecourse this past weekend. Four exchange races were held on Saturday(the Singapore Turf Club Trophy will this year be run on August 30, the day before the Challenge Cup) while the YTN Cup, traditionally the finale of the Jockey Challenge took place on Sunday. First up was the Macau Jockey Club Trophy. Three-year old colt Clay Shot (Wildcat Heir), 5/1 chance, took the honours by just under a length under jockey Choi Bum Hyun. Next came the Horse Racing Ireland Trophy which saw odds-on favourite Sun Gear beaten into fourth place in a tight finish where 7/1 shot Pinot Noir (Capital Spending) just got the better of Revereduction (Revere) right on the line. On a blustery day where national flags were hoisted and lowered over the racecourse at a speed greater than that of some of the runners, the VIP balcony groaned under the strain of a procession of visiting dignitaries that included the Ambassadors of Turkey and Ireland. One race later, Choi Bum Hyun made his 2nd visit of the day to the Presentation stage after guiding Ganghae (Didyme) to victory in the Selangor Turf Club Trophy. Ganghae’s victory came at the expense of the much vaunted Raon Morris who despite being sent off at long odds-on following a very easy win last time out, faded in the home straight as Ganghae came past to record his 4th win from 13 starts. The feature race of the day, however, was the Turkey Jockey Club Trophy, the only class 1 event on the program. And in what was a very open betting race, 50/1 outsider Seoul Jeongsang (Capital Spending) swooped late to claim a narrow victory, giving jockey Lim Gi Won his biggest race win to date. It was also the biggest win in 6-year-old Seoul Jeongsang’s career, and only his 5th from 36 starts. Stakes action returned to Seoul on Sunday in the shape of the YTN Cup, one of very few televised live races in Korea (by virtue of it being sponsored by the YTN Cable News Channel). Run under the floodlights and in a torrential downpour, 5-year-old American-bred mare Big Power (A.P.Warrior) beat out Dragon Hill and Strong Wind to win by a length under Ham Wan Sik. Riding the third horse home was Moon Se Young. The champion jockey rode six winners across the weekend and moves onto 999 for his career. Next weekend, he’ll bid to become only the 2nd Korean jockey in history to ride 1000 career winners.